a. Administering packed red blood cells without a filter can cause hemolysis of the blood product. b. Administering packed red blood cells without a filter can mount a histamine response in the patient. c.	Administering packed red blood cells without a filter can cause the accidental infusion of a blood clot or debris. 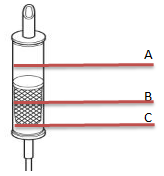 d.	Administering packed red blood cells without a filter can cause infiltration of blood product at the IV site.